stever20: what surprises, if any, did you have with the award finalist announcements on Monday? Jay Jaffe: While it took me a day even to get to looking at the list of finalists because of how immersed I was in the Hall stuff, I guess the biggest surprise — but not all that big of one — was that Chris Sale didn’t make the AL top three in Cy Young voting, owing to his late-season absences. That’s not to begrudge Verlander, Snell and Kluber their spots, it’s just a gauge of the steep cost of Sale’s absence and subsequent struggles upon returning. Beyond that, slight surprise Lorenzo Cain slipped out of the NL MVP top three and Javier Baez in, but both had great seasons. Not a major quibble, though. The Old Buccaneer: Do you see the Zunino/Mallex deal as one likely to work out for both teams? Jay Jaffe: quite possibly. I think Zunino’s ongoing ups and downs on the offensive side are indicative that a change of scenery could help. Smith turned in a nice season and fills a hole that the Mariners have really struggled with in recent years. Jay Jaffe: Off base to the point of being cringe-worthy. I think it’s quite clear that the players ARE the product and aren’t replaceable in the manner he suggests. Craig Swan Lake : Will the MLB writer voters for awards eventually be replaced by Statcast algorithms? Jay Jaffe: not happening. The major awards are issued by the BBWAA, an organization whose job is first and foremost to protect the interest of the writers within its membership. Major League Baseball could in theory decide that it wants to issue its awards via another process, but that wouldn’t necessarily stop the BBWAA from doing its thing. Jay Jaffe: The Hank Aaron award, which is voted on by fans as well as media, as well-intentioned as it is, already shows how difficult it is to compete against the BBWAA awards. Outta my way, Gyorkass: The Harper contract will be (over/under) $400M total, will contain (over/under) 2 opt outs, and will be signed for (over/under) the value of Manny Machado’s eventual deal. Jay Jaffe: Under $400 million, with one opt out. I predict Harper and Machado will split the honors with one getting the biggest $ amount and the other the highest AAV. Craig Swan Lake : Does Keith Hernandez ever get into the Hall of Fame? Jay Jaffe: I think he’s got a better case than any player on the Today’s Game ballot (he’s under the purview of the Modern Baseball Era Committee, which will vote next year) — a bit light in JAWS and traditional career totals due to both his unusual offensive profile for the position (low power, high AVG) and his mid-30s fade/retirement. But the impact his defense had was outsized, and I certainly think that the right panel could someday elect him. Xolo: Don’t all these ballots water down the Hall of Fame? Jay Jaffe: The small-committee processes that have been in place since the beginning of the Hall of Fame voting have produced a mixed bag of results, no doubt. Many if not most of the institution’s most egregious mistakes can be tracked to the Veterans Committee or its predecessor, the Old Timers Committee. The Era Committees have done a better job in this regard; even if the ballots haven’t been all that strong, it’s not as though we’re seeing a flood of substandard candidates being elected. If anything, the bar has been a bit too high, if guys like Minoso and Allen aren’t being elected, and Whitaker and Grich aren’t being placed on ballots. Not that I love the Jack Morris election, but pairing it with Trammell and opening the possibility of Whitaker getting a fair shake — that’s a worthy trade. Outta my way, Gyorkass: How to the Brewers handle 2B this season, pay up for the Schoop tender, and hope he holds his own long enough to bring up Hiura, or do they look elsewhere? Jay Jaffe: Schoop is a flawed player, sometimes maddeningly so, but the guy totaled 6.0 WAR in 2016-2017 and has one more year of club control. The free agent market at 2B is primarily bounceback candidates — Murphy, Harrison, Kinsler, Dozier, even LeMahieu if you’re considering his weak-sauce offense — so I’m not sure why they wouldn’t bet on a less expensive one in Schoop. Craig Swan Lake : The Mets & Yankees used to play an annual exhibition game called the “Mayor’s Trophy Game.” I can’t seem to find pictures of the trophy on line. Was there one? If so, anyone know where it is now? ____: If deGrom doesn’t win the Cy Young, Mets fans should (a) riot, (b) finally stop caring about awards, or (c) hope it saves the team some money on deGrom’s arb salaries? Ryan: The Reds have mentioned the FA market as the source of a pitching upgrade, but should they be looking at the trade market instead? It seems they could deal from their surplus of position player prospects in an attempt to acquire Kluber, Carrasco, or Paxton. A Tribe Called Kipnis: Thanks for the series on the Today’s Game HOF ballot. While not quite HOF level, Will Clark was surprisingly great for a longer period than I remembered. He comes off as 85% Edgar Martinez (similar but not quite as good OBP and power). Did enough media members like him enough to stick on the ballot for more than one year? Jay Jaffe: Apparently not, because he did last just one year, receiving 4.4%. He’s already been on one Today’s Game ballot and I’d expect that if he doesn’t break out this time past the “fewer than X votes” crowd then he won’t be on the next one in 2022. Matt: Let’s say the Braves sign Brantley and trade for JT Realmuto…do they enter 2019 as the prohibitive NL East favorites? Jay Jaffe: I’d want to see what they do with their pitching, and what the Phillies and Nationals do, before I start throwing the tag of “prohibitive favorite” around. Those teams aren’t standing still. Ariel White: Why did Wellington Castillo’s bWAR (and possibly other WARs as well, I haven’t checked) bounce around so much while he was not eligible to play (and therefore not playing). 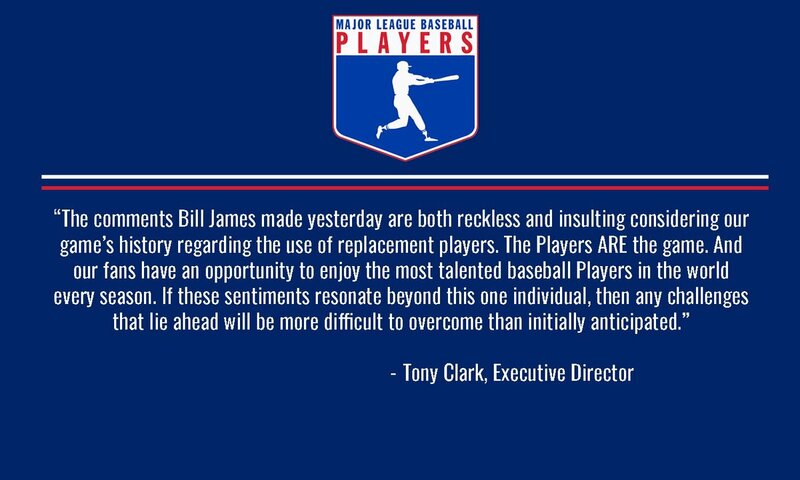 In other words, how does someone who isn’t playing have their WAR change by more than half a run over the course of a week? (I could give other examples of injured or otherwise not playing players whose WAR moved a lot). Jay Jaffe: it’s my understanding that defensive stats like DRS and UZR don’t get updated on a daily basis. Also, things like league constants can change within seasons. But more to the point, sweating half a run difference is a damn waste of time. stever20: With the AL Cy Young, if Verlander wins and Kluber has a lot of support vs Snell- are the voters saying that innings matter- that you can’t have only 160-180 innings and be in contention for the awards? Jay Jaffe: As I wrote in connection to Chris Sale’s case in early September, innings very much matter to voters. https://www.fangraphs.com/blogs/chris-sales-abridged-cy-young-case/ Except for strike seasons or the weird years when relievers win (none since 2003), we haven’t seen a starting pitcher with fewer innings than David Price’s 211 in 2012 win except for Clayton Kershaw (198.1 in 2014). GSon: Do you agree that Jose Ramirez should have been # 5 on the AL MVP list.. JD deserved to be in the top three? Jay Jaffe: No. Defense matters, which is why I’d put JD outside the top three. Ariel White: Why is Torres getting so much ROY attention, more importantly, why is Wendle (who probably deserves the award the most) not getting any attention at all from anyone even on FG and on BP? Jay Jaffe: Defense matters, and Torres had a much better year with the glove than Andjuar. Wendle had a very good year, good enough to win in some seasons, but Tampa Bay doesn’t get a lot of coverage for reasons that aren’t always fair. It’s also worth noting that Wendle had 104 PA two years ago, and 118 in 2016-17 which may have caused some confusion over his status; the cutoff (130 at-bats) is rather arcane. Brad Lipton: Today’s Game ballot. Not who you think should be voted in, but who you think will be voted it. Jay Jaffe: he showed some signs early in the year but appears to have given most of that back. His GB/FB actually got worse, relative to 2017. That said, the kid is 23 years old and built to mash. If guys like J.D. Martinez, Justin Turner and Max Muncy can figure it out eventually, I don’t see why Mazara can’t – but he needs the right instruction. Dave: On a scale of 1-10, how big of a shock will it be if Soto beats Acuna for NL ROY? Dan: Major League Baseball has the best baseball players in the world. If they all stopped playing they would still have best players in the world. the best in he world would be a little worse but MLB would be the basically same. I think the longing for older, better players would have a small effect on profits for longer than three years though. Jay Jaffe: If they all stopped playing in MLB, presumably there would be a rival league ready to spring up full of experienced MLB players. Lou: Did the Zaidi hire increase the chances of a Bumgarner trade? Jay Jaffe: Yes, but not to the point of certainty. As an outsider coming in, he’s bound to have less sentimental attachment to Bumgarner, and of course he was hired for having the longer-term view of the franchise in mind. If that means trading Bumgarner this winter or next July, I think he’ll be more able to pull the trigger than Bobby Evans would have been. AD: Looks like Justin Upton has a good shot at breaking Reggie Jackson’s career K’s record. What’s your estimate for Upton’s HOF chances? Jay Jaffe: 10-20%. He’s got some solid career HR and hit totals thanks to his early start, but hasn’t done enough to consistently be considered one of the best players in the league, so he’ll be viewed more as a compiler than a true star unless he starts stringing together 5-win seasons in his 30s. that’s not an easy thing to do. IndyMets: Keith will enter the HOF as a broadcaster .. He’s the cream! Jay Jaffe: (whispers) the Frick Award isn’t “entry” to the Hall. It’s a photo in a separate wing, not a plaque in the gallery. Josh in DC: Who came up with the ballot for “Today’s Game”? If you were to ask me to come up with 30 recent players that maybe deserve another thought for the Hall of Fame, I’m not sure how long it would have taken me to come up with Joe Carter. Jay Jaffe: it’s something called the Historical Overview Committee, made up of veteran BBWAA scribes, and I mean *veteran*. IIRC I counted four Spink Award winners among them and an untold number of appearances on various Vet/Era Committee panels. While I do know that some of the individuals on the committee have, say, cited WAR before, collectively, their frame of reference isn’t one that jibes very well with a stathead view of the ballot or the Hall. Jay Jaffe: I don’t think Mussina will get to 75% in this traffic, but I think there’s a good chance we see the other three go in. Josh in DC: Since Pete Rose and Joe Jackson are ineligible for the Hall of Fame, shouldn’t George Steinbrenner also be ineligible? I can’t remember the details, but didn’t Steinbrenner also consort with gamblers, and was kicked out of baseball for a year? Jay Jaffe: Jackson and Rose are on the permanently ineligible list. They have not been reinstated by any commissioner. Steinbrenner was banned in 1990 for paying $40,000 to a private investigator to dig up dirt on Dave Winfield, but was reinstated in 1993 by Bud Selig. Therefore, he is eligible for consideration. It’s not quite a parallel situation, but a player suspended for PEDs gets reinstated and then remains eligible for HOF consideration. Doesn’t mean that a voter needs to forgive the suspension, though, and I suspect Steinbrenner’s two suspensions (the other related to illegal campaign contributions in the 1970s) work against his election. I’ll have more to say about him in my Today’s Game series. FA: Are you guys tired of all the Harper/Machado questions yet? Jay Jaffe: It comes with the territory of being a baseball writer. I’d much rather be asked about Harper/Machado than why I can’t fill out those TPS reports correctly, or whether I’ve made my monthly sales quota, or whether this thing looks infected. Ariel White: Why are current averages given as HOF standards for your JAWS? If only above average guys are elected, that will cause the standards to get higher and higher (there aren’t enough guys who deserve to get elected for postseason or amazing peaks that fall short on JAWS etc to keep the averages down). Shouldn’t players be elected if they are within one or a half stdev or something like that? Jay Jaffe: calling it “the standard” is a shorthand; it’s interchangeable with “the average.” The stated goal of the JAWS project is to maintain or improve the standards of election, or at least prevent them from getting eroded. That said, there are considerations outside of WAR/JAWS that are completely germane to the Hall discussion (postseason performance, historical significance, career gaps caused by the color line, military service or even severe injury or death) that might well justify the inclusion of a player whose JAWS is short of the standard. And the standard isn’t intended to be a binary yes/no — when it moves by half a point or whatever when a superstar or substandard candidate is elected, it shouldn’t really change how we feel about somebody who’s within a point on either side. Nate: What do you think about Matt Harvey as a possible match in Houston? Think there’s still any chance of resurrecting the Dark Knight? Jay Jaffe: Houston seems to have a good track record of fixing/restoring pitchers, so yeah, he might be a fit there. Given the level of interest in him around the deadlines, I suspect he’s going to wind up with a noncontender while he continues to try restring his value. FA’s: Yankees biggest free agent signing will be _______? I am the Walrus: Reports have the Cubs watching their budget. What’s your best guess, smoke screen or can they really afford Harper? Jay Jaffe: Cots estimates them as having a $209 million payroll for 2019, including arbitration raises. Unless you make a couple trades and creatively structure a Harper deal it seems like the Cubs would be in luxury tax country for 2019, but after Hamels and Zobrist come off the books in a year, they’d have more room. Bottom line, I wouldn’t entirely rule out the Cubs but they’re lower on my list to sign him than I would have said a month ago. Joseph Garrison: Any interest in seeing some work later this winter that somehow marries the idea of WAR, WAR7 and JAWS with Win Shares, Win Shares over 11 consecutive seasons and Win Shares comparison by position. This is how I will spend my off season… fun with Spread Sheets. Jay Jaffe: It sounds like fun but IMO, Win Shares has long been surpassed as a useful measure in this arena. I love my copy of the New Bill James Historical Abstract and the perspective it provides but I think its measures are themselves historical now — we can do better, and we are. Yankees: Can they land Corbin and Keuchel in FA and flip Sonny Gray and prospects for Paxton or Kluber? Jay Jaffe: That’s a hell of a lot — at most I can see them signing one of the two OR trading for one of the big guns, not necessarily with Gray going the other direction. Scott: Albert Belle isn’t going into the Hall of Fame, but Kirby Puckett is in. If their public personas were reversed would that still be the case? Jay Jaffe: Belle has had his brushes with the law, including a stalking case in 2006, but Puckett’s history of violence against women suggests he much worse. Had what was known about him at the time of his death been common knowledge, I don’t think he’d have been elected. ____: The Mets make 1 surprisingly bold/large move this offseason. What is it? Jay Jaffe: Signing Machado would be my best guess if they were to do something big and shocking. I’d put the odds of that at well under 50%, though. ty: what are your thoughts on where bryce harper will go? everywhere i look i see writers talking about how harper will go to the giants, but with Farahan Zaidi as their new head of baseball operations, i dont think hell go after Harper. He was on a podcast with Alex Pavlovic, and talked about filling out the 40 man. Jay Jaffe: Today, I’d put the Phillies and Dodgers as the top two candidates for Harper’s service, in spite of the news that the Dodgers have said they want to stay below the tax threshold. Tom: Do you think that team specific Hall of Fames help or hurt a candidate? For instance, could Ted Simmons being inducted to the Cardinals Hall of Fame help his candidacy, being acknowledged publicly as an all-time great for that team, or would it hurt his candidacy, in that the Committee would look at that and say, he got some recognition? Or do those not come into play, really? Jay Jaffe: I think they tend to help raise a candidate’s visibility. No harm done. Xolo: Why is Ohtani not the runaway consensus ROY? Is it just Yankees fans being Yankees fans or is the season Ohtani had really that unappreciated? Jay Jaffe: Ohtani’s season is underappreciated and overshadowed somewhat by his elbow injuries, first the absence and then the TJ. I do think he’ll win AL ROY handily, if not necessarily unanimously. Lawrence: On average, how many Hall of Famers are playing in the majors at any given time? And do you think we currently have a higher or lower number? Jay Jaffe: It varies based on the period of time. As I wrote in The Cooperstown Casebook, the average over a very long swatch of history, from 1885-1993, the average was 1.79 HOFers per team per season, and that’s since gone up with the elections of Morris and Trammell. For the period 1961-1997, which is about as far as one could go at the time of the book’s publication before coming to the point where a lot is still up for grabs, it was 1.36 which equates to about 41 active Hall of Famers. I suspect fewer than 41 players active right now will actually be elected, but that gives you an idea. brooksie: Who do you think will win the AL Cy Young Award? Jay Jaffe: Snell. 20+ wins with a sub-2.00 ERA is a very tough combination to beat, historically speaking. stever20: what do you make of the claims that the Dodgers aren’t going to pay the luxury tax the next 4 years? Jay Jaffe: Not sure yet. Certainly enough to raise an eyebrow. Jay Jaffe: A lot depends upon whether Greinke wants to pitch in New York (he has a 15-team no-trade clause) and how much money the Dbacks would eat. Adam: Thanks for chatting, Jay! I’m reading the Cooperstown Casebook currently. The line about Ortiz being “literally the player to be named later” was brilliant. Jay Jaffe: Thank you! I have to credit a past version of myself for that one — first used it in the Baseball Prospectus 2005 book about the Red Sox, Mind Game. Canoodle: If you were Kim Ng and Fahran offered you the GM position to help run the Giants, would you take the job? Jay Jaffe: Yes, in that I think the Giants’ situation is a much better one than the Mets or Orioles openings would be. On the other hand, I can understand if Ng feels like she’d be too secondary under Zaidi or if their philosophies aren’t necessarily a great match. The front office has turned over since she was there, but I do wonder if Ng would be a better fit to replace Zaidi in LA. Jay Jaffe: OK folks, I’ve pretty much run out of time today. Thanks for stopping by, keep reading about the Today’s Game candidates, and I’ll see you next week! We hoped you liked reading Jay Jaffe FanGraphs Chat – 11/8/18 by Jay Jaffe! Brooklyn-based Jay Jaffe is a senior writer for FanGraphs, the author of The Cooperstown Casebook (Thomas Dunne Books, 2017) and the creator of the JAWS (Jaffe WAR Score) metric for Hall of Fame analysis. He founded the Futility Infielder website (2001), was a columnist for Baseball Prospectus (2005-2012) and a contributing writer for Sports Illustrated (2012-2018). He has been a recurring guest on MLB Network and a member of the BBWAA since 2011. Follow him on Twitter @jay_jaffe. The link to the trophy that you put up is behind a paywall.